Among biblical scholars today are those who quite rightly are concerned with the ideology and values that are implicitly exprestext the sed in what otherwise seem to be works of objective fact and analysis. 1. E.P. Sanders contributed significantly to demolishing the explicit anti-Jewish tendencies in New Testament and the over-emphasis on the Law versus Gospel distinction. 2. E.P. Sanders downplayed historicity of the conflicts between Jesus and his opponents as presented in the Gospels. I applaud the intention behind such discernment. Many of us have been taught in Sunday schools and churches that Judaism was dominated by a narrow-minded legalism from which Jesus came to deliver us. There is no doubt a good measure of unhelpful stereotyping going on here. The Gospels themselves, especially those of Matthew and John, are largely to blame for this. We might, in fact, turn Sanders’ suspicions of twentieth-century German scholarship on Sanders’ use of Bultmann, in this case the handling of Mark 2.23-28 and Mark 7.1-23. Sanders argued that these have ‘extraordinarily unrealistic’ settings. Pharisees ‘did not organize themselves into groups to spend their Sabbaths in Galilean cornfields in hope of catching someone transgressing’. Similarly, according to Sanders, it is not credible that scribes and Pharisees journeyed from Jerusalem to Galilee to inspect the disciples’ hands. ‘Surely’, he concludes, ‘stories such as these should not be read as describing actual debates between Jesus and others’ (Sanders,Jesus and Judaism, p. 265; cf. Sanders, Historical Figure of Jesus, pp. 74, 215-16; Sanders, Jewish Law, pp. 19-23, 84-89. Meier would also stand in this scholarly tradition). As might be expected to follow from this position, such stories were deemed to be church creations in response to Jewish criticisms. 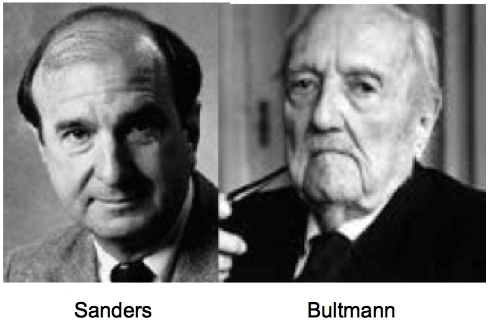 I find myself agreeing with Bultmann and Sanders here. Later in the post Crossley refers to Bultmann’s well-known point that in Mark 2 the Pharisees are not questioning Jesus but his disciples — i.e. the church. This was seen as a pointer to the cornfield-sabbath controversy being an invention by the church to address criticisms it was facing over the sabbath.